Incredible colors, rolling hills and craggy ridges await you in the badlands of North Dakota. Teddy Roosevelt Natl. Park encompasses thousands of acres. Some of the most dynamic territory in the park is the south unit. A diverse array of wildlife grazes across these valleys. You’ll see picturesque bluffs painted in deep purple and red hues under the wide sky. You can listen to birds chirping as you meander across miles of trails, pausing to take a dip in the refreshing water. There are a variety of activities you can participate in while exploring the park, and a lot to learn as you do it. What exactly will you find here, and how can you make the most out of your trip? Hiking the trails at the park will take through some pretty breathtaking scenery. You’ll get to experience the badlands up-close and personal when you take on the hiking trails here. Fortunately, there are trails suitable for everyone. Hikes range from 10 minutes to 12 hours, and vary in difficulty from easy to quite strenuous. To find the perfect hike for you, check out the park’s hiking page. Here you’ll encounter information on length, duration and difficulty, as well as directions on how to get there. The badlands get around 30 inches of snow every year. Though trails are covered with snow in the winter, you can ski or snowshoe around the badlands at your leisure. Be aware that hiking trails are generally not used as ski paths. Those traversing this winter wonderland will blaze their own trail across the bluffs. You’ll have to bring your own equipment if you wish to participate. Take a canoe or kayak trip: You can float for days down the river in a canoe or kayak. It’s recommended that you take sufficient water, food and gear along with you. Much of the river is remote, which provides a great way to get back to nature — but it also limits communication and narrows your safety net should anything go wrong. Fishing in the river: Grab your rod and reel. Fishing is permitted in the Little Missouri River. Channel catfish abound here, as do goldeyes and sauger. In order to make sure all your permits are up-to-date, check out the North Dakota government’s fishing regulations guide. The badlands’ wildlife is something to behold. You have the chance to see bison, deer, longhorns, bobcats, and golden eagles, along with a plethora of other animals. Only in the south unit will you be able to gaze upon the famous wild horses that occupy the land. These majestic animals are descendants of the horses utilized by the plains Native American tribes during the 1800s. Make sure to pay a visit to the Theodore Roosevelt Nature Center, the Visitor Center with all the information you need. Here you’ll find a small museum with exhibits relating to the geology and natural history of the badlands. You’ll be able to visit the Maltese Cross Cabin, President Roosevelt’s temporary home during his time in North Dakota. The cabin has a rich history which you’ll be able to explore through a tour. You’ll step back in time as you view items which once belonged to Teddy. His trunk and desk sit in the cabin today. Though no lodging is offered, you’ll have the option to camp in the South Unit. Cottonwood Campground is just six miles away from the South Unit park entrance. Some sites are available through reservation, while others are set aside for walk-in campers. The rates vary between summer and winter. During the summer months, rates are 14 dollars per night. In the wintertime, rates drop to 7 dollars per night. Drinking water and a latrine are available year-round, though flush toilets are only available during the summer. Stock up for camp at the nearby town of Medora. You can also choose to stay at any number of hotels in Medora. Because of its close proximity with the park, this town is the perfect place to make your home base at night as you explore the park by day. 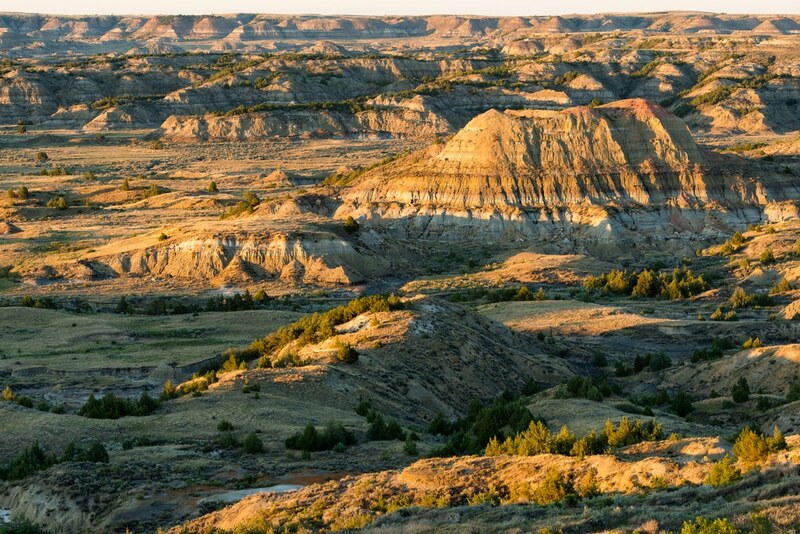 Visit the Theodore Roosevelt National Park’s South Unit to explore the badlands. Step back in time and examine the history of this dynamic land as it pertains to our culture. You’ll find the badlands don’t exactly live up to their name — there’s nothing “bad” about them. You’ll certainly feel good about yourself and your history as you discover all that the North Dakota bluffs have to offer.